Join The Year of the People. Vote! Encourage others to vote! 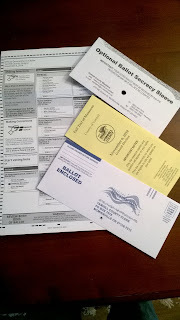 I live in Oregon, U.S.A., where we voters have already received their mail ballots. If your state does not use paper ballots I thought you might like to see one. 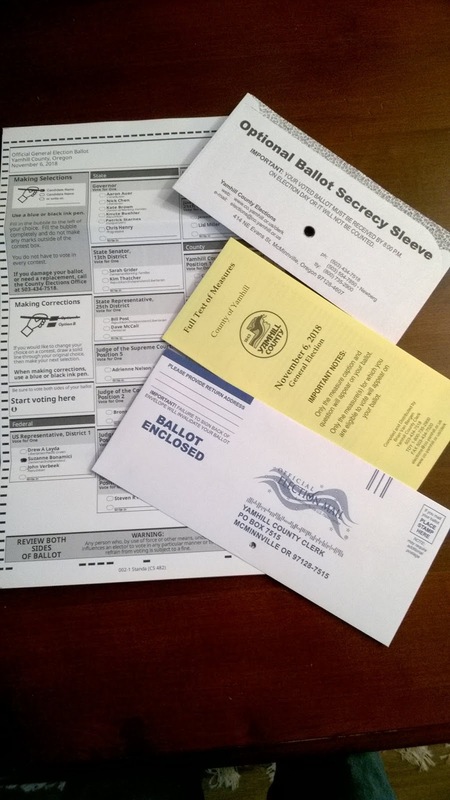 Just below, here's a photo of an Oregon paper ballot. You vote in privacy at home; you return your ballot in its secrecy envelope to your county auditor. For comparison, here's an image of a voting booth in Summit, New Jersey, U.S.A. You enter, pull the curtain shut, and vote in privacy. Wherever you live, and whether you vote by ballot or by machine, if you have the right to vote use it especially in November 2018! I'm not telling you how to vote, except to vote for candidates you trust to uphold the promise of the American values of liberty and justice for all. Keeping American values straight is the main issue of the 2018 election. I want you to have your say. Sounds simple but be discerning. If you want to go a bit further, vote for candidates committed to maintaining truth in government, justice for the poor and middle classes (Social Security, Medicare at present levels or better) and to environmental preservation. Let's make 2018 the YEAR OF THE PEOPLE. VOTE. If you're a registered American voter, exercise your right by the deadline on November 6, 2018. This could be the most important election of your lifetime. Important for your kids. Important for your planet. Important for your own personal finances. VOTE BY THE DEADLINE ON NOVEMBER 6. Updating on October: thoughtful votes hugely needed in U.S. Senate races. You can read Reliable projections here at "538."